A-Z and everything in-between: A celebration of calligraphy. 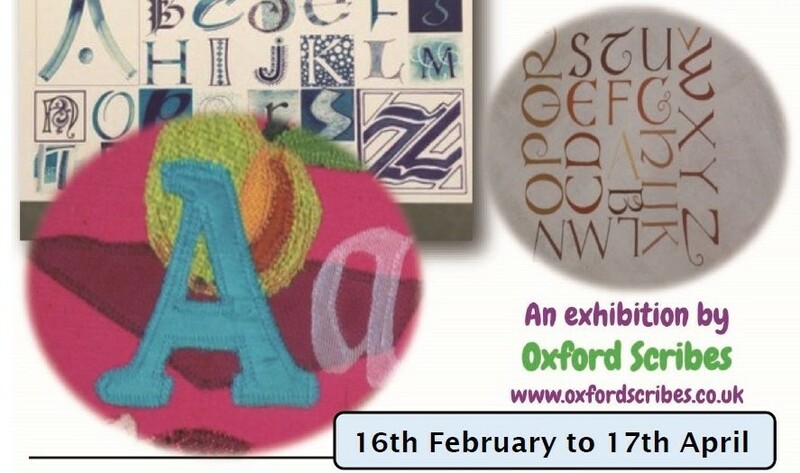 The exhibition will focus on Alphabets from any period of history or culture, as well as the newly designed, and will include work based on texts which have inspired our members. Thame and the surrounding area have also proved to be inspirational and work exhibited will be varied; from traditional gilding to modern 3D work using gold, inks, beautiful papers, stone and glass. Whilst coming to see the exhibition, you may also like to visit Kew Bookbinding at 61A North Street open between 11.00 – 3.00 pm where they will be happy to show a few visitors at a time around the bindery – definitely worth a visit. If you need to replenish paper, nibs or ink, Glynswood Art shop at 11 High Street has lots of art and craft supplies – also worth a visit. If you fancy lunch The Black Horse, The Thatch, The Birdcage and the Six Bells all in the High Street. For afternoon tea Treacle’s cafe is know for toasted teacakes or for something special go to Rumsey’s Chocolaterie in the Upper High Street where you can watch the chocolates being made whilst you sip your tea. The Book House is a brilliant independent book shop with very helpful staff and sells beautiful books, stationery and unusual cards – not to be missed.